He mankaded Jos Buttler tonight. Against the spirit of the game. Last edited by Abdullah719; 26th March 2019 at 00:55. He mankaded Jos Butler tonight. It's not against the spirit of the game, is it? Isn't it in the rules now? There's so many rule changes I seriously forget sometimes. serial mankader? How many times has he done this before? It's within laws of the game. Not that I care about IPL or Ashwin. They should check his action tho, I must say! Ashwin did this to Lahiru Thiramane. Sehwag opposed it as captain and brought the batsman back. Last edited by Abdullah719; 25th March 2019 at 22:14. Once before as stated above in one of the tweets. A bowler can only "mankade" a batsmen if he/she has strayed outside his/her crease after he/she has started his/her run up, but before he/her has entered his/her delivery stride. In most cases, I defend Mankading. I especially defend mankading after a warning has been issued. In this case, Ashwin was setting him up. This is a dangerous precedent. Spinners will come in and go through with their actions without delivering the ball, instead they will run the batsman out. In most situations like this the umpire signals deadball. If the ICC says that bowlers can now set up batsmen and then mankad them then fair enough but there needs to be absolutely clarity on that. If the ICC says no you may not pull out of your bowling action as Ashwin did there then that should also be made clear. Ashwin had better stay in his crease in future! Live by the sword, die by the sword. I would argue that Ashwin was well into his delivery stride considering his foot lands as if to bowl. If the ICC allows this, then you'll see more and more cases of mankading especially in close games. As a bowler, I will just not deliver after going through the motion. Ashwin is the most hated person in cricket today. This has happened to Butler before as well against Sri Lanka in an ODI I believe. Ashwin pulls out of his action and Buttler is still in his crease. Buttler again ? Did he not learn his lesson after Senanyake in 2014 ? Yeah, that's what I figured too. He was well into his action and the 3rd Umpire messed up the decision. Ashwin reminds me of Indian cricketers from the 90s, home track bullies with poor sportsmanship. I am all for stopping the whole warning nonsense, but that shouldn't be out. He doesn't leave the crease before ashwin completes the action ashwin cheated here, there should be a fine and clear warning for this. That was Butler being stupid this was ashwin straight up cheating. Butler was inside the line when ashwin entered the delivery stride. Wrong call by umpire. This was a dead ball. It should of been given not out, Ashwin waits for Butler to come out of his crease and wasn't in the motion of delivering the ball. This was Blatant cheating, Butler was backing up fine, if this isn't shot down as illegal by the ICC then it starts a dangerous precedent. Should have been not out given Buttler was not going to be out of the crease by the time Ashwin would have bowled. Wrong decision and poor form from Ashwin. Lol nothing creates a bigger controversy in cricket these days than mankading. He’s a snake for this. He’s hurting the integrity and professionalism of a league made to nurture genuine talent, not this type of cheap behavior. What Ashwin has done is not only unfair because Butler was clearly aiming to leave his ground at the time the ball was going to be delivered but according to the laws of MCC it is also illegal. Last edited by RedwoodOriginal; 25th March 2019 at 22:56. It seems Ashwin's the baddest man in cricket right now. How has he gathered that much attention. This is totally against the rules. I have no idea why one of the commentators is defending Ashwin! He already entered his delivery stride and then STOPPED midway in his action to knock off the bails. The runner is allowed that head start once the bowler has already entered his bowling stride. How did the 3rd umpire give this out? Poor from both Ashwin and the third umpire - shouldn't be allowed again. KXI Punjab won in the end so all the haters out there wishing bad for my Punjab this is for you! Deal with it. We were the better team tonight. In hindi commentary, everyone took Jos Butler's side. It's against the laws it seems. Pathetic from Ashwin. It was cheap because Butler wasn't doing anything wrong such that he needed to be warned or anything. He was being extra careful with his bat behind the line even while he was walking forward, you don't expect a runner to keep looking at bowler's arm to see if he has delivered the ball or not. Ashwin is a delusional character like Umar Akmal. Since Ashwin is educated and speaks good English so he gets away with all the nonsense he keeps talking esp ever since he has been dropped from limited overs team. It's quite hilarous how often he describes his past performance using words like 'extraordinary'. That's because most Indian commentators are cheerleaders of Indian players. Nothing wrong with Ashwin's tactics and this is not the first time this Butler lad doing this! Poor RR fell like a pack of cards after Butler's dismissal! And no, it's not the Butler's wicket that lost the game for them, it's their pathetic middle order and lower order batsmen who couldn't buy a run against the KXI. Last edited by Tyler Durden; 25th March 2019 at 23:07. To those saying it is within the laws, you're wrong. The batsmen can leave the crease after the bowler has started his delivery stride. 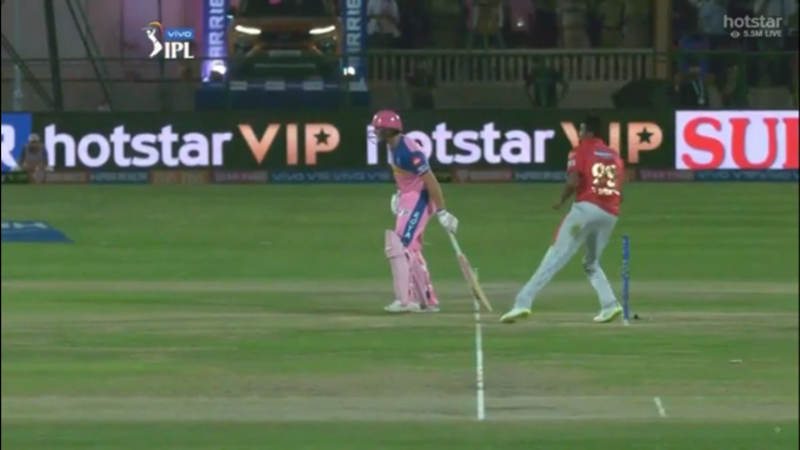 In this case, Ashwin was in his delivery stride, stopped midway, waited for Buttler to start out and then ran him out. This was completely unfair on Buttler and pathetic by Ashwin. This ISN'T permitted by law, the law has been misapplied. The change in wording ("would be expected to deliver the ball") explicitly excludes the situation where the bowler purposefully delays his delivery stride Think about it. Otherwise the word "expected" is redundant in that sentence. Buttler was not stealing ground AT ALL! Poor umpiring in this case. I've said it in the past and will say it again, Ashwin tries to be too clever for his own good. He thinks he's some sort of genius and often comes across as a wannabe. He has been rightfully slammed by so many fellow cricketers on twitter. What a disgrace! Its legal, and if it was an asian batsmen there wouldnt be so much criticism online. That settles it then. Not very honorable but not cheating. Has the law been updated? Been reading multiple versions of it. However, even if we go with this, you can clearly see Ashwin delaying his delivery stride solely to catch Buttler out. The non-striker cannot keep his eyes on the bowler till the ball is released! This was a cheap tactic from Ashwin no matter how you look at it. Utter nonsense from you jones! Law 41.16: (playing condition interpretation) OFFICIAL! Jones is wrong for the exact reason Styris gives. Jones has completely ignored the word "expected" in the new law. The drafters of the law explicitly excluded the interpretation Jones is offering. What Ashwin did is not permitted by law. Umpire error. If it's done again and again by bowlers. Cheap or not. Sennayanake also did this to Butler, if bowlers are doing again and again then why make a habit of leaving ground early. Every small margin matters in some games. that extra millimeter can save batsman when he is at opossite end. I like this rule to give balance strength for fielding side. I have seen keeper waiting for batsman to lose balance and disloges the bails. It's similar to this. Ashwin put his teammates in a very uncomfortable position as well. I normally don't mind Mankads if the batsman is stealing ground but here he has started his delivery then stopped and waited for Buttler to leave his crease. I don't want to see that kind of bottom feeding tactics in cricket sorry. Umpire had to compare his earlier deliveries that he actually waits a bit before releasing his ball. Don't watch This video in slow motion. One can argue that this was the expected time of delivery a moment where he is just about to release the ball. Butler was just outside and ball isn't delivered either. Despite ball not being delivered, Butler is out of the crease. No really argument to that (Mankading incident) and it's pretty instinctive. I actually didn't load and he left the crease. That's always been my take on it because it's my half of the crease. I was not even at the crease, he wasn't even looking at me and he just left the place. He's probably been waiting to do this since becoming captain. No one can veto him. Not a fan of doing this unless you tell the batsman before and he doesn't listen. Then it's fair game and the batsman deserves it. Ashwin also has some 350 test wickets @25odd. Umar Akmal isnt worth mentioning as a cricketer along side Ashwin. I am hearing multiple interpretations of the law. If it was within the law then its fine. There is nothing about compulsorily warning the batsman, in the law. What a liar! He was in his delivery stride before aborting. Also, Buttler was not looking to steal ground or get an unfair advantage. Ashwin is a petty individual. No handshake after the game. Look at that awkward and half-embarrassed look on his face now. What an unlikable character. Does a batsman warn a bowler that he is about to come of the crease (where he is already standing outside of the crease) and he gets a momentum and yard to hit bowler for a six? Enough with the name calling and attacking a player's character. He is still playing within rules. One side people are seeking for balance between ball and bat, and when rules are made to allow that, people complain. If Buttler was actually trying to gain an advantage before the ball was delivered, that would be cheating, and be considered to be out. In this situation, Ashwin pulled out of his delivery stride to deceive Buttler, as per the laws of the game, this should've been declared a dead ball. The Argument that he WAITED for the Buttler to leave the crease, so Ash is wrong. Lol, how else he suppose to Mankad a batsman if he didn't wait. What was Buttler doing then? People who understands that why this kind of rule is in place, will support Ashwin for this. Because bowler can see it himself whether batsman is jumping down the pitch or not. Also bowler can bowl from behind the stumps as well. In mankding batsman at non striker end has no chance if cunning bowlers like ashwin adapts to this kind stop-start bowling action techniques and start deliberately running out batsmen. Lol it's very simple. Just watch the bowler, stay under the crease. Ball gets released. Leave your crease. Make this habit. Getting a fast paced 'walking movement' gives a clear advantage to runner. And many batsmen switch their stance to destort bowler, batsmen can leave a crease right at the delivery, and bowler has no way to recover. Batsmen can do switch hit. Some batsmen leave the crease and then come back. ASHWIN you absolute PLONKER !! 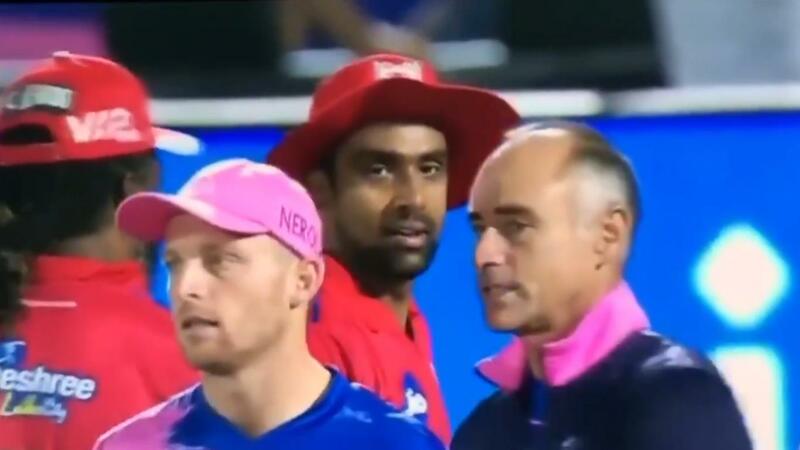 Was Ashwin really expecting Buttler to shake his hand. You would've thought Butler had learnt his lesson when it happened last time but no. Lots of useless moral argument from 'gentlemen cricketers'. Not surprising in the least. You're kidding me, right? Your lot will go to any lengths to defend your own. Geez! Forget the moral argument! Ashwin pulled midway during the delivery stride. Buttler was IN THE CREASE when Ashwin stopped (screengrabe above). He had no intention to ball the ball. It was a wrong call! Last edited by Saj; 26th March 2019 at 01:24. Yes it was. I just don't like the way its being argued. Spirit of cricket is a mythical beast that everyone describes differently. They should only argue the rule and its interpretation. Last edited by Abdullah719; 26th March 2019 at 13:26. Looks like you need some burnol for the burn Ashwin caused! It's a Legal dismissal and it's decided by the Official Umpires and that's where the story ends! How do you Mankad a batsman if you have full intention to bowl? Well done Ashwin. Nothing better than seeing these self-righteous western cricketers moan when something doesn't go their way. Wish it was done more often as it is legal so people should get over it. All times are GMT 5.5. The time now is 09:32.